Reduces insertion trauma and improves placement accuracy of penetrating neural implants in pre-clinical studies. We designed the NeuralGlider-Cortical System to maximize the quality of chronic neural implant recordings in pre-clinical neuroscience studies. 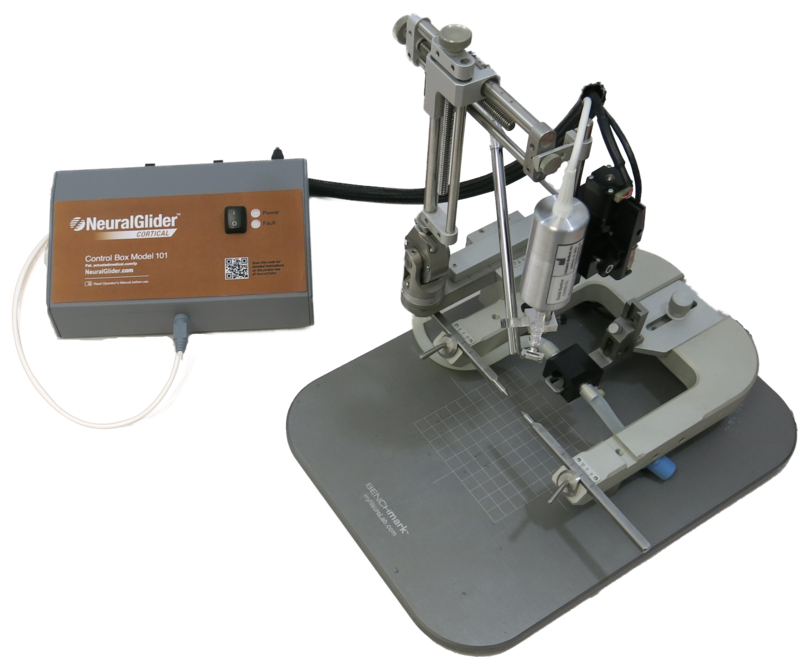 NeuralGlider-Cortical applies micron-scale, ultrasonic vibration to microwire arrays during insertion to reduce the force required to penetrate the brain surface. The reduced insertion force facilitates slow (≤ 0.1 mm/s), accurate array insertions while minimizing displacement/dimpling of the cortical surface, preserving the integrity of the underlying neural tissue. Reduced insertion force and tissue dimpling yielding less insertion damage and neuron loss. Integrated software for control of insertion velocity and depth. Improved insertion of fixed microwire arrays. Enables slow insertion velocity with less tissue strain for better control of final placement. NOT FOR HUMAN USE. The NeuralGlider-Cortical System is for research purposes only. Ultrasonic vibration of microwire arrays during insertions with NeuralGlider significantly reduced penetration force in an agar brain model, and ex vivo rat and porcine cortex (reductions in force = 86.3%, 76.5% and 62.7%, respectively). The reduction of force correlates to a 70 – 80% reduction in cortical surface displacement/dimple during array insertion, for all tissues. * p < 0.0001; error bars = standard error of the mean. All data were normalized to the non-vibrated/control insertion average for each tissue. Compared to a standard control insertion (left), NeuralGlider reduced cortical surface damage and blood brain barrier leakage (IgG staining, red) at the microwire array insertion site (right). Images showed 20 μm rat cortical sections, 2 weeks after implantation with 2x4, 50 μm microwire arrays. Neural recordings from two channels on an array inserted with vibration (Days 2 and 13 post implant) demonstrate whisker stimulation evoked activity with good signal-to-noise ratio. Downward arrows indicate whisker stimulus (blue: rostral-caudal; orange: caudal-rostral). Post stimulus time histograms on Days 2 and 13 are also shown (180 whisker stimulations). Click the link below to download a 1-page datasheet on the NeuralGlider-Cortical System. These works are/were partially supported by the Defense Advanced Research Projects Agency (DARPA) Contract No. HR0011-16-C-0094. Approved for Public Release, Distribution Unlimited. The views, opinions, and/or findings contained in this work are those of Actuated Medical, Inc. and should not be construed as an official government position, policy, or decision unless so designated by other documentation. Actuated Medical, Inc. © 2017. All rights reserved.